Whew – That Was Some Vacation!! This only entertained her for 20 minutes but how wonderful to have this!! Sorted by categories, I had a new package of tabs that she labeled. A brand-new 3-ring binder. So easy! Why don’t we take 20 mins to do these things to make looking for recipes a bit easier? (and the cupboard to look a bit neater?) If your mom isn’t there wanting to help, I bet you have a child or grandchild to help you! 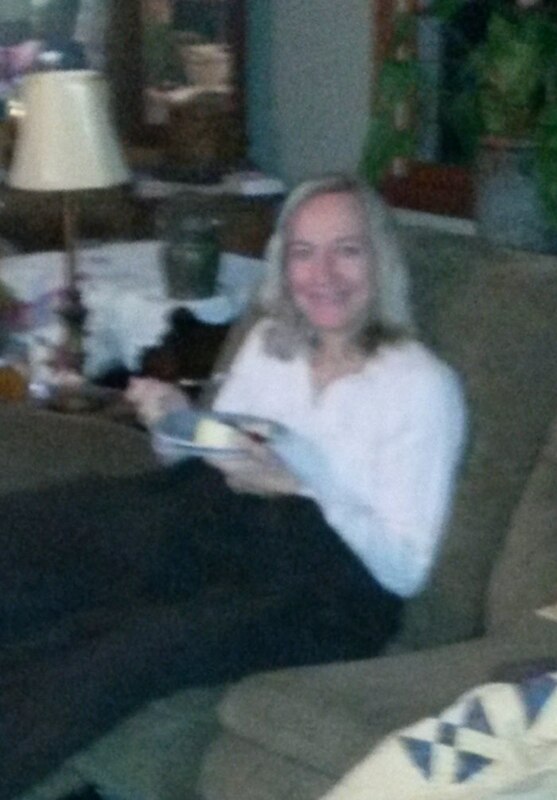 I continued to sew and she had her knitting and a snack as the morning progressed. I have a master pattern (mostly) ready to make some tops and jackets. Hopefully, now I can get some clothes made even though I’m not there to tailor to her all the time. A going-away lunch out with friends who wanted a chance to visit with my mom before she headed home. Early the next morning, we met DBrother & DSIL at a parking lot to switch Mom’s seats and bags. (….ummmm – where did that tank top weather go???) DSIL was quite pleased with the new artwork coming to their house! We all had good vacation time. They headed for a long drive home! I did a bit of shopping and then chatted with a NY sister on my drive home. I was thankful that one’s spring break was the traditional week before Easter this year so he was home about 10 days. 🙂 The other one just had Sunday off but got off work a bit earlier on Saturday than normal and was home by 6:45 p.m. so we had time to visit and sit before I turned into a pumpkin and headed to bed! We all went to the early service at church so dinner would not need to be so late. By the time we were home, P’s parents were home from their service and came over for dinner. * I had out a can of cherry pie filling for a topping and that vanished! *Gingersnap cookie crumbs with vanilla & butter and toasted in a pan a bit for those that were missing crust to the cheesecake. The grands enjoy it when the kids are home. They get to have a meal here and have plenty of time to visit. Finally in January there are some days at home to cook pumpkins that we harvested this fall. They’ve been happily waiting their turn in the basement and garage. One day I cut and deseeded 2. I roasted them in the oven until soft and then processed in my Victorio strainer. Love it!! I had close to 8 cups of pumpkin! In the evening I made a double batch of muffins with fresh ground wheat. I was short 2 eggs so read and chose a banana for the substitute. I put in 1/2 chocolate chips and half pecan pieces. I don’t need all the amount of chocolate chips to cloud my thinking of how many muffins I consume! I also announced that night that I needed someone else to cut pumpkins! So while the muffins were in the oven, my farmer cut 3 more pumpkins for me. And in the meantime, I had looked at the Victorio book closer and it said to cook in 1″ – 2″ cubes and then process. Yippee!! That takes away the scooping hot flesh out of the rines. The next morning, I cut one more pumpkin. I was glad to have the oven on most of the morning since the temperatures outside were struggling to find only 0’F that day! With the pumpkins cubed before cooking, I was able to get 22 cups of pumpkin in the freezer and had only about 7 cups of trash of skin. The skin came out all dried and cleaned of the nutrients. I’m glad to have more pumpkin in my puree than back to the trash. Here is my whole wheat muffin….. ummmmm…..
I’m done with processing pumpkins for now. Three days worth gave me about 40 cups of pumpkin puree in the freezer and 4 batches of pumpkin muffins (most in the freezer). I think that is plenty really. For several reasons, I actually cooked a real meal (vs wraps or leftovers) for lunch and on a holiday, no less! I’ve realized that often my in-law’s Christmas “day” is on Jan 1 but it wasn’t this year. Meanwhile, the men were watching a movie, I was moving from this to that, left a burner on, checked the oven, put the hotpads on the stovetop, went to another room…. I went to the kitchen and the hot pads were laid onto the just turned off burner and were smoking! I threw them in the sink with water and then they were sent to the deck so they wouldn’t keep smelling. No volunteer firemen were invited for dinner. Whew! Lunch was fine – Cheesy Chili Chicken. 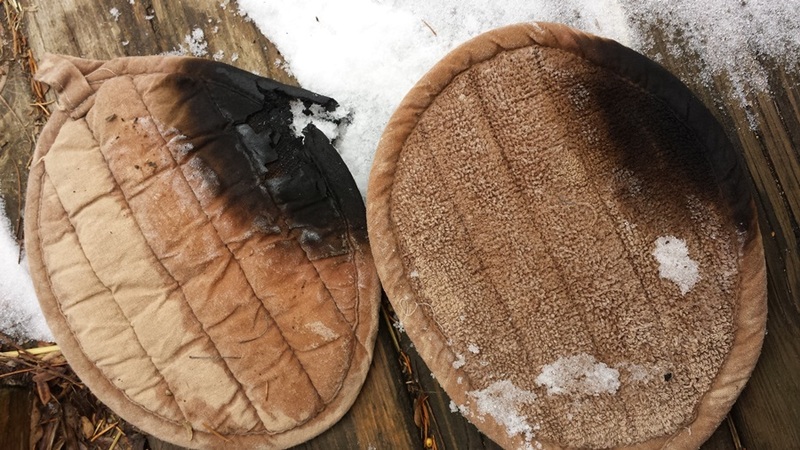 They were my favorite hot pads so if you recognize them and know where I can buy them… let me know. Zucchini noodles — made with K’s tool and I soon bought my own! The shrimp was so easy to make! And the best ever!! Best meal I’ve had in a long time!! 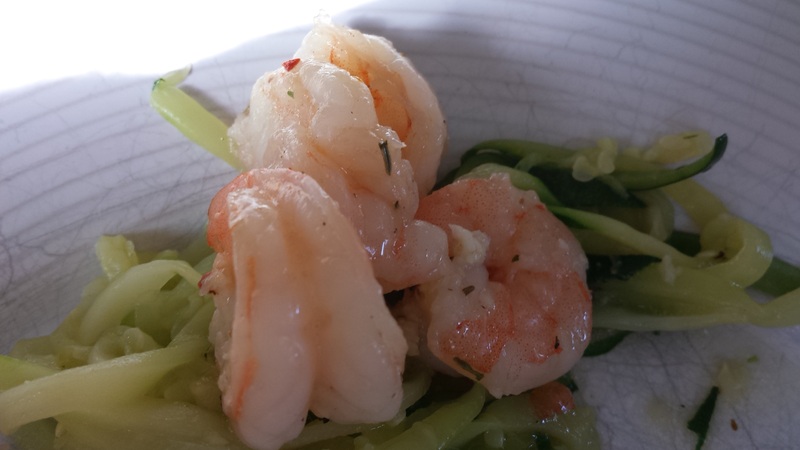 P helped me peel the shrimp and that took awhile… we had 3#. JP cooked regular noodles and K cooked the zuke ones. I had the mashed potatoes in the crockpot. 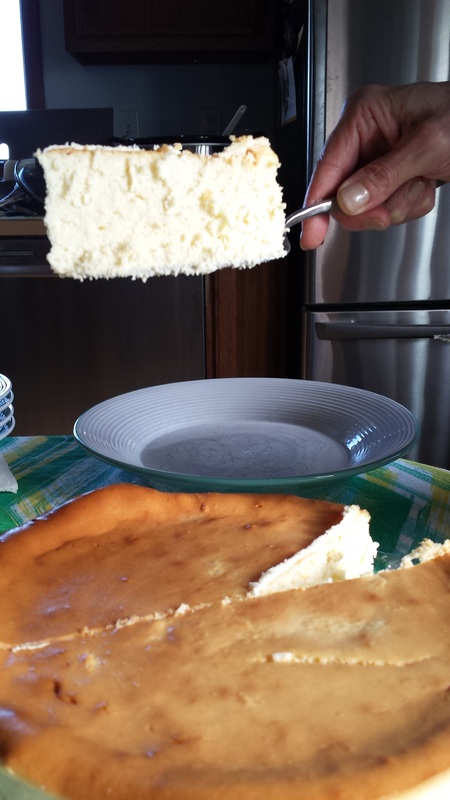 And seriously… you know I don’t spend extra time in the kitchen… and I made this cheesecake!! JP suggested raspberries for the cheesecake topping. I bought 3x the amount of frozen ones as we could have paid with buying “fresh as Illinois gets…” so all could have plenty! There are no words for how good this was! I think K & I were stuck on our chairs unable to move after all this. There were leftovers of everything — the kids had to-go boxes for a few more meals and P & I ate several more meals as well. 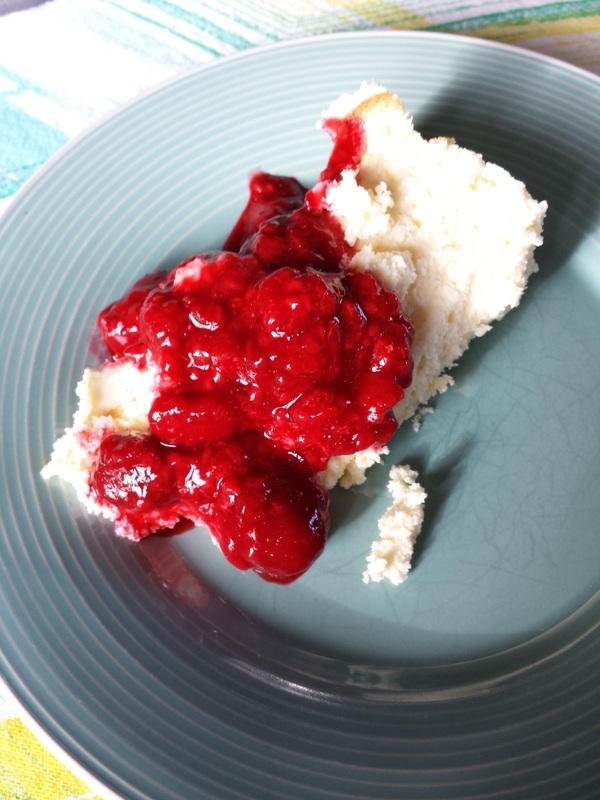 And seriously, what is better for supper on Christmas Day than a piece of cheesecake? I got the original recipe from a blog linked here. Line a 4-sided jelly roll pan with foil. Cover with a single layer of pretzels. Melt two sticks of butter in a small saucepan. Add one cup brown sugar and stir together. Boil just a little and keep stirring until it gets darker. *You want to let it cook just to the point that you think you may have ruined everything. That’s when the caramelly, sticky magic happens. Pour over pretzels. Bake at 375 for 7ish minutes. Remove from oven and immediately throw your chips on. The heat will melt them, then scrape your rubber spatula over them to spread them around. Sprinkle liberally and generously and graciously and lovingly with sea salt. Cool a bit on the counter. Then pop into the freezer for an hour or until you remember it’s in there. Break apart into bite sized (aka fist-sized) pieces. Fall asleep with salty lips. Wake up with bark mouth. My first batch was too soft… we had to eat it ourselves. (so sad….) The 2nd batch was hard enough and was sent but of course some little pieces were picked up by me. This is so good… I eat enough to get sick to my stomach… but soon it is gone and I withdraw from the sugar once again. This has been my stand-by recipe, was a normal snack years ago, and is still good. Put pop corn in a brown paper grocery sack, discarding old maids. Dump out of bag onto 2 large cookie sheets to cool. Crumble and keep covered if any lasts. 1 cup pitted mejool dates. To measure, pit your dates and then pack them into the measuring cup before soaking them in the hot water. For me, this was about 14 smallish dates. Soak dates in very hot water for 15 minutes. Drain before proceeding. Blend the dates, coconut milk, coconut oil and vanilla extract until a smooth paste forms. Add 1/4 tsp. salt, blend, and taste. Add a bit more salt if desired. Place in the fridge or freezer until firm and pliable, at least 3 hours. 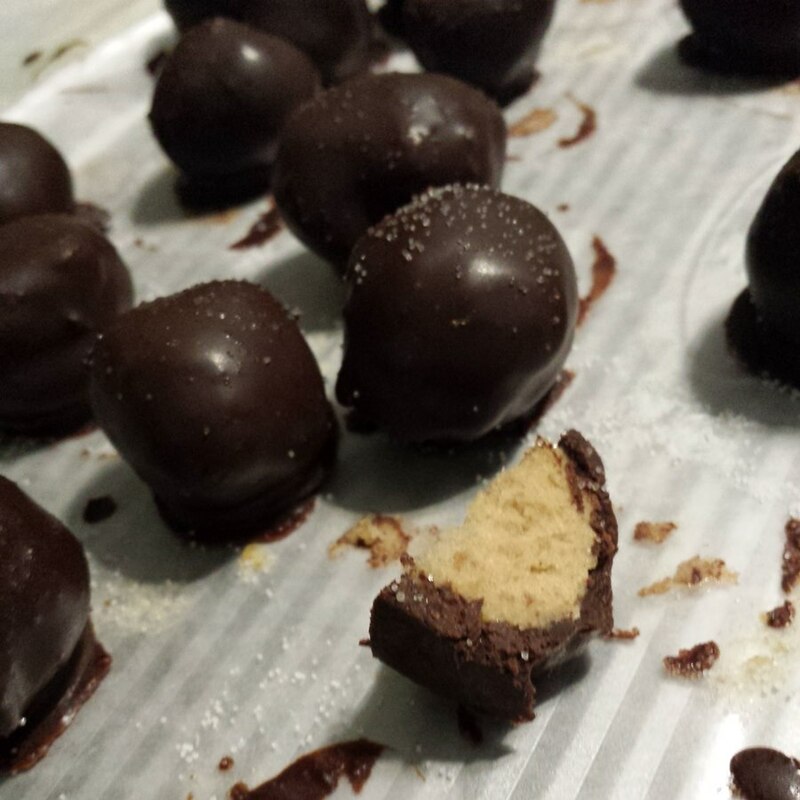 Roll teaspoons of the date mixture into balls. (work fast) Dust lightly with coconut flour so they don’t stick to each other. Place in the freezer to stay firm. Make the chocolate coating: melt and stir together the cocoa powder, coconut oil and raw honey over very low heat until combined. The mixture may separate slightly, in this case put it in the fridge for just a few minutes and then stir. Let the mixture cool until thickened enough to coat the caramel balls. Place in the fridge for a few minutes if it is too runny, but keep an eye on it because it hardens very quickly. If you are using the chocolate chips instead of the homemade chocolate coating, just melt the chocolate chips over low heat until smooth. Do not overheat. One by one, roll a caramel into the chocolate and place on a baking sheet lined with unbleached parchment or waxed paper. Sprinkle very lightly with the unrefined salt, and place in the fridge until the chocolate coating is firm. Store in the fridge. If they aren’t consumed quickly (most likely), they last at least a few weeks in the fridge. Ok… these won my heart! Not really sugar in them except the maple syrup. I do not like cream filled candy at all. These are not that texture. More coconut flavor than dates.